If we are to look at the statistics of men who are currently more concerned about their physical appearance, this could automatically prove a competition between them and the women. 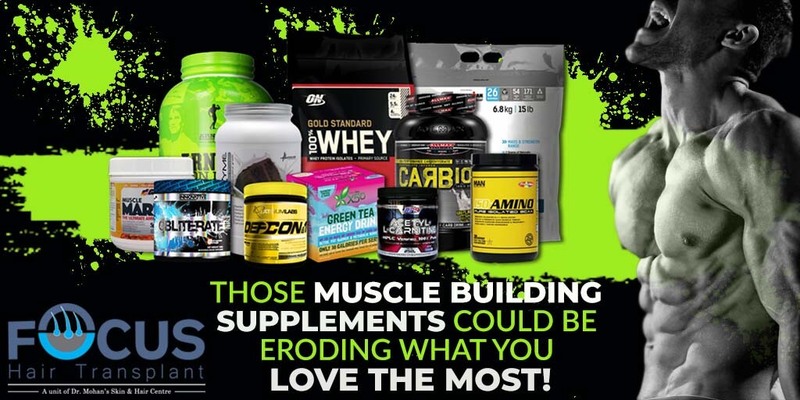 What most of us hear about are protein supplements that many men of all age groups take to build muscles while attending their gym programs. A certain study proves that millions are being obtained annually from a number of supplements that men take to obtain a muscular physique. These supplements are normally in the form of powder or capsules are easily available. To provide the desired appearance, these supplements work by boosting one’s metabolism, promoting energy, or providing more proteins. For some individuals and particularly gym goers, rely on these supplements for dramatic transformations that occur at an expense realized later on in the future. Some doctors stress that these supplements could be okay for the body but are quite addictive and hair loss is one of their disheartening side effects. When all they Do is to harm Your Body! Supplements are many in form and taken for different reasons. For the case of gym members, some protein shakes like inorganic growth hormones and creatine are very addictive. Due to the thirst that comes from them, they raise the testosterone levels in the long run. Of course, they will give you the desired muscle mass, but the results, in the long run, could be depressing. Men who are at a high risk of facing the sore part of these supplements are those with a genetic predisposition to balding. In the case exposed or take these supplements in a large amount, a great amount of hair loss can be lost sooner. These men will basically lose their hair because of the increased testosterone levels that activate an enzyme known as 5-alpha reductase. As a result, a chemical known as Dihydrotestosterone (DHT) is produced which causes hair thinning and hair loss. This chemical generally works by inhibiting the growth of new hair cells on the scalp hence baldness. Men with a genetic predisposition to hair loss, or those where androgenetic alopecia runs through the family should stop taking protein shakes as quickly as possible. In other cases, it is quite important to identify those supplements that cause hair thinning or a receding hairline before they actually lead to baldness. According to studies, certain creatine and DHEA, which are growth hormones not only increase, muscle mass in men but also double or increase the testosterone levels in the body. Therefore, instead of relying on these, it is quite essential to use high-protein foods to build your muscles. These foods include fish, chicken, meat, eggs, and legumes among others. These completely have no side effects and will help save your hair follicles. Men who already have damaged hair follicles should also stop the supplements before more damage is done. It is unfortunate to stress that already damaged follicles can’t be repaired. Another technique is to evaluate the forms of physical exercises as some can directly increase testosterone levels which increase hair loss.